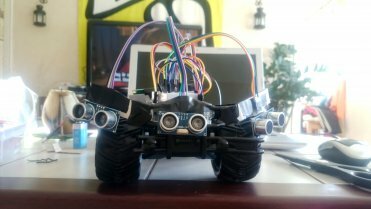 All the front sensors are hooked up and the code is uploaded to the Arduino, will it work or will it catch fire? Only one way to find out! No fire, but I have to admit that in early testing of the motor board there was some smoke from bad wiring.., but found some bugs in the code like the steering not turning left. Also when testing this code it's very good to have the motor board shut off in the beginning so you can focus on the most important parts, the obstacle avoidance. Also I have rearranged the wiring on the Arduino board to make it nicer and easier to see what IO-ports that are free.. Not many is the answer if you was wondering. The turn left if both sides are free is just set for now, will randomise this in the future. After you have checked so the right behaviour is displayed on the LCD I suggest switching on the engines to see if they behave correctly. You will probably have issues with them running in the wrong direction but en easy fix. I also had some trouble with getting the breaking to kick in but after some changes to the logic part of the code this was fixed. I have noticed that the sensors have a much smaller detection angle than I initially thought and if you get to close to the sensors they wont detect anything. This might create some problems in the future..
Below is the code, a demo video and a download link for the example code. Next step is to set it free and see what happens.